"Have you ever wondered what's the truth about meat? Is it really as bad as many people think? "When I teach critical thinking and how to analyze research, I point out that despite what we think is true, if an exception exists (and I don't mean an individual, but an entire culture) then what we believe is simply not true." "....Mostly, though, what we tend to do is ignore what we disagree with, disregard science and keep marching forward with our beliefs, incorrect or not. Keep this in mind as we look at what's true and false about meat." With all this Ms. Merritt tries to convince the reader that she has superb critical faculties, a strong grasp of the science of meat and health, and never ignores findings that she finds disagreeable and readily changes her views to accord with evidence. Let's see if she lives up to her own promise. "Just so you know, arachidonic acid is a necessary Omega-6 fatty acid..."
Thereby she implies that we have a dietary requirement for arachidonic acid (AA), which is absolutely false. While AA is biologically essential, adult humans have no dietary requirement for AA because the body can produce all AA required from linoleic acid, which is according to the Institute of Medicine Food and Nutrition Board "the only n-6 polyunsaturated fatty acid that is an essential fatty acid," and abundantly supplied by plants. "An analysis of a Paleolithic culture (who did not have the level of inflammatory disease that we now have) shows an AA intake that is double ours. So, again, what's wrong with us or our meat that gives us a different result? Guesses, anyone?" Kuipers, Remko S., et al. "Estimated macronutrient and fatty acid intakes from an East African Paleolithic diet." British Journal of Nutrition 104.11 (2010): 1666-1687.
counts as an "analysis of a Paleolithic culture (who did not have the level of inflammatory disease that we now have)." 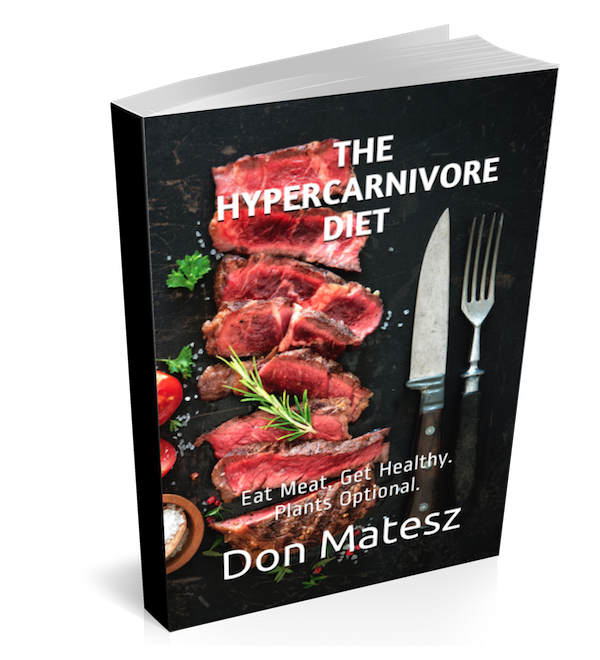 "The objective of the present study was to reconstruct multiple Paleolithic diets to estimate the ranges of nutrient intakes upon which humanity evolved." The words "reconstruct multiple Paleolithic diets" and "to estimate" tells you right off that this paper is speculative, not factual, more aligned with science fiction than epidemiology. It did not report the actual dietary intake of any actual Paleolithic culture. So of course this imaginary Paleolithic culture eating multiple imaginary diets can be as high in AA and as free of inflammatory diseases as you like. Fiction has no limits. Further, no actual Paleolithic culture has ever been or ever will be surveyed for inflammatory diseases. Paleolithic cultures existed in Paleolithic times, i.e. between 2.6 million and 10,000 years ago. No one knows what the incidence of inflammatory diseases was in true Paleolithic cultures. Modern African hunter-gatherers are not Paleolithic cultures. They have tools (e.g. bow and arrow) that Paleolithic people did not have. The relative freedom from modern inflammatory degenerative diseases among some modern hunter-gatherer tribes has a lot to do with the fact that they rarely had food surpluses, carried loads of blood draining parasites (reducing inflammatory iron levels), had short lifespans (died before the age at which cardiovascular disease or cancer starts to take lives), and, in many cases, ate meat infrequently. "Conventionally raised animals in feed lots eat an enormous amount of grains, instead of grass, changing it's nutritional profile for the worse, and driving a structure that requires a lot of farming. Much of the carbon footprint worldwide from cow products comes from clear-cutting rain forests to create grazing lands, which we don't do here, and we import very little from those countries. It's actually not cow farts that cause methane, but cow burps, but again, landfills easily lead for methane production and it's actually mostly from kitchen waste." According to Johnson and Johnson, landfills contribute 30 million metric tons of methane per year, while livestock and manure together contribute 90 million metric tons, or 3 times the contribution of landfills. Yes, Ms. Merritt, "we" do tend to ignore what "we" disagree with, disregard science and keep marching forward with "our" beliefs, incorrect or not, don't "we"? "And we don't take into account the transport and production of our vegetables. This study pointed out that 'long-distance air transport, deep-freezing, and some horticultural practices for producing fresh vegetables may lead to environmental burdens for vegetarian foods exceeding those of locally produced organic meat.'" 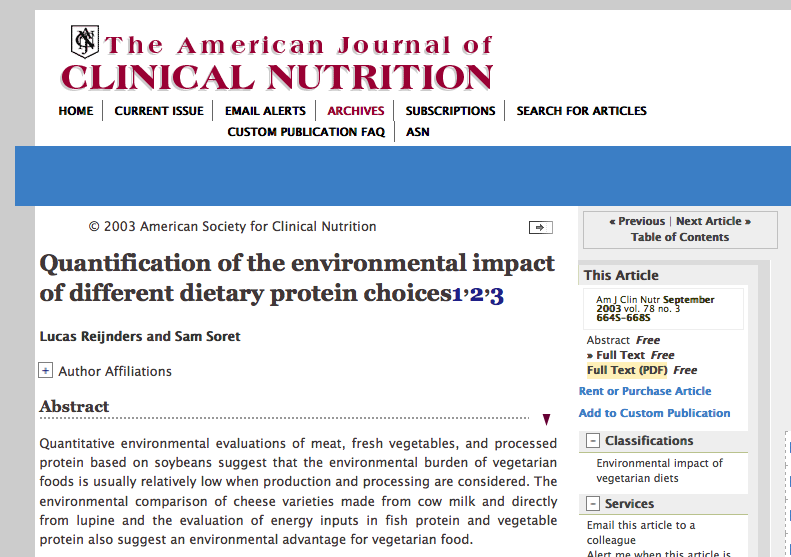 "Assessment suggests that on average the complete life cycle environmental impact of nonvegetarian meals may be roughly a factor 1.5–2 higher than the effect of vegetarian meals in which meat has been replaced by vegetable protein." "Mostly, though, what 'we' tend to do is ignore what 'we' disagree with, disregard science and keep marching forward with 'our' beliefs, incorrect or not." "What about the claim that animal protein causes cancer? If that was true, then the traditional Inuit would have had rampant cancer (instead of their .01% rate) because they ate mostly animal protein and fat, as the permafrost kept them from planting vegetables." In keeping with her suggestion to engage in critical thinking, I noticed that Merritt did not provide any scientific reference given to support this claim about the Inuit, something I expect from people who claim to be teaching critical thinking. This could very well be because there is no evidence to support this claim. No traditional Inuit group was ever properly evaluated by modern epidemiological methods for cancer incidence. Moreover, most scientists are aware that cancer is caused by mutagens that disturb DNA replication. Due to the absence of data indicating that animal protein is mutagenic in and of itself, scientists tend to avoid the claim that "animal protein causes cancer" and prefer to investigate whether or not meat-eating promotes and therefore increases the risk of cancer tumor development. This means that Merritt has created a straw man –– "animal protein causes cancer" –– that has few if any scientific defenders. However, as pointed out by Travis at Healthy Longevity, the observation of higher risk of cancer among populations eating high meat diets is well documented as far back as 1908. In The Natural History of Cancer William Roger Williams reviewed the medical literature and documents providing evidence from a large number of global populations before the widespread practice of grain-feeding animals, i.e. this data pertained to people eating wild and grass-fed animal products. The data showed that nations with meat-based diets had a significantly higher incidence of cancer compared to nations consuming primarily plant-based diets. Williams also noted that within nations with meat-based diets as the norm, groups that largely abstained from animal foods, such as nuns, monks, slaves and prison inmates had a reduced incidence of cancer. "Cancer is commoner in Argentina which comprises the Pampas region inhabited by the Gauchos, who for months subsist entirely on beef, and never touch salt than in other parts of South America. On the other hand, among the natives of Egypt, who are of vegetarian habits, and consume immense quantities of salt, cancer is almost unknown." This pattern has not changed in more than 100 years. The positive link between meat consumption and cancer is supported by a very large body of epidemiological and experimental data. Both the American Institute for Cancer Research and the World Cancer Research Fund recommend avoiding or limiting meat to reduce cancer risk. Inuit life expectancy is 13 years less than the general Canadian population and this gap is not closing. The idea that Inuits were immune to cardiovascular disease is also a myth based on a woefully inadequate evidence base. There is also paleopathological evidence that pre-contact Inuit had cardiovascular disease: Extensive atherosclerosis was found in pre-contact Inuit mummies. Since breast and prostate cancers are age-related and Inuits tend not to live to the ages at which these cancers manifest, it is hardly surprising that they rarely manifest these cancers. However, some preserved mummies of pre-contact Inuit show evidence of death from nasopharyngeal carcinoma. If cancer was extremely rare among Inuit, as claimed by Merritt, the chances of even one individual with evidence of cancer being preserved would be astronomical. The fact that cases have been found indicates that cancer was not rare among them. The idea that cancer was rare in Inuit at any point in time lacks scientific evidence base. As I have previously discussed at length, cardiovascular disease, cancer, and obesity are endemic among Mongols living on grass fed animal flesh. Merritt presents the Inuit as evidence against the link between meat-consumption and cancer, yet it is clear that she never took time to find out whether the claim that the Inuit rarely had cancer has an adequate evidence base. It does not. The idea that Inuits or other groups living on grass-fed animal flesh had low rates of diet-related cancers is not supported by sufficient quality evidence. "Despite what you might read on the Internet regarding being healthy as a vegan/vegetarian, there is negligible amounts of B12 in the soil, you don't convert beta-carotene to vitamin A nearly as well as you might think, vitamin D2 (found in plants) is not as effective as D3, etc." Once again, right when evidence support is required, I notice a lack of any references documenting the implication that B12, vitamin A, and vitamin D deficiencies are unique to people who abstain from meat consumption. "The researchers also expected to find some connection between dietary intake and plasma levels, even though other studies found no association. And they did find a connection. Supplement use dropped the percentage of volunteers in the danger zone--plasma B12 below 185 pmol/L--from 20 percent to 8. Eating fortified cereals five or more times a week or being among the highest third for dairy intake reduced, by nearly half, the percentage of volunteers in that zone--from 23 and 24 percent, respectively, to 12 and 13 percent. The B12 in meat is bound to proteins making it largely unavailable to many humans. B12 is available directly from microbes that produce it in the form of supplements and fortified foods. This is more bioavailable due to it being free of animal protein binders. This is why the Institute of Medicine (IOM) recommends B12 supplementation to all people, regardless of diet, after the age of 50y. Merritt provided no evidence to support her implication that conversion of carotenes is insufficient to meet vitamin A needs. In the text Dietary Reference Intakes, the IOM states clearly that carotenes can meet vitamin A needs. Moreover, promoting non-specific "meat" for vitamin A misses the mark because, except for liver, animal meat is a very poor source of vitamin A activity. A 100 g sweet potato provides 22,000 IU of vitamin A activity – 4 times the RDA – and about 1100 retinol activity equivalents (USDAsr27:11508). A cup of boiled kale provides almost 18,000 IU of vitamin A activity – 3.5 times the RDA – and 885 retinol activity units (USDAsr27:11234). A 100 g serving of whole egg has only 540 IU of vitamin A activity – only 10% of the RDA – and only 160 retinol activity equivalents (USDAsr27:01123). A tablespoon of butter (14 g) has the same caloric content as the 100 g of sweet potato, but it provides only 355 IU of vitamin A activity and 97 retinol activity equivalents (USDAsr27:01001). A 100 g serving of grass-fed beef strip steak has so little vitamin A activity that the USDA doesn't even list it (USDAsr27:13000). The idea that non-specific meat is the best source of vitamin A activity lacks evidence base. "Both osteoporosis and problems with skeletal repair has been described in Thule skeletons, which suggests that a lack of vitamin D (possibly caused by a lack of sunlight) may have increased these problems." Published on December 2, 2014 by Hal Herzog, Ph.D.
For years I shunned sunlight exposure. My only or main source of vitamin D was from supplements or fortified foods. My bones and teeth are strong. I have had many falls over the years - some with me landing flat on my back or my pelvis - but I have never had a broken bone (apart from my nose which was broken when I was a meat eater). I have been vegan for 35 years. I have recently come to realise that moderate sun exposure is more beneficial than harmful and now don't worry about it. As for the environmental effects of meat or plant protein - if we grew more plant foods in our own countries and didn't have so much grassland supporting sheep and cattle, there would be even less transporting of plant foods and less need for refrigeration. It may be true that most people who adopt a vegetarian or vegan diet return to meat eating but most of them will have adopted the diets for health or fashion reasons. Those of us who do it for ethical reasons tend to stay with it. We are brainwashed (yes, brainwashed) from birth that we need meat. Our parents tell us and we believe them. The brainwashing continues with all the propaganda from the meat and dairy industries, which includes endorsements from 'celebrities'. Most people tend to trust celebrities and aspire to be like them. The first twinge of pain, a stomach upset or a lack of energy will be blamed on the new diet because, deep down due to all the brainwashing, some believe we really do need meat. People find it hard to give up smoking or drinking alcohol and many backslide at the first temptation. No one believes they need those things, their parents didn't tell them they did, but they still find it hard to give them up even though they know it is healthier to do so. It is at least as hard to give up meat after a lifetime of eating it. It would be good if more people ate less meat but it is better that they completely stop eating it. Only the example and encouragement of healthy vegans can dispel the beliefs of the majority that they need meat. Only then will they stop ascribing some annoying physical complaint to their newly-adopted non-meat diet.